Warm oil in a pot over medium heat. Add onion and sauté until softened, 6 to 8 minutes. Add garlic and curry powder and stir until fragrant, about 1 minute. Raise heat to medium-high, add zucchini, pour in broth and add 1 tsp. salt. Cover and bring to a simmer. 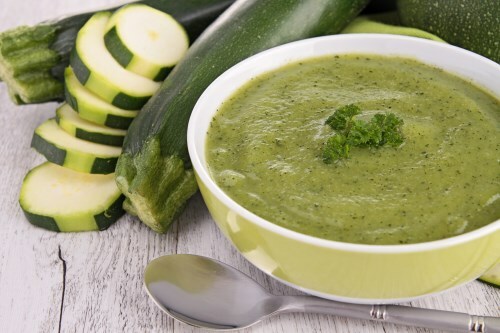 Remove cover, reduce heat to medium to maintain a simmer and cook until zucchini is very tender, about 20 minutes. Remove from heat and let soup cool slightly. Working in batches, puree soup in a blender until smooth. Transfer to a large bowl, cover and refrigerate until chilled, at least 2 hours. Just before serving, whisk in sour cream and season with salt and pepper. Ladle into chilled bowls, garnish with cilantro and serve.